Okay…just so you all know…you will be see A LOT of this set! What absolutely BEAUTIFUL backgrounds you can make with it! I noticed that the color challenge on SCS was Crisp Cantaloupe, Pistachio Pudding and Garden Green. This was one of those cases that when I say the challenge I immediately knew what I would do and amazingly it turned out EXACTLY I thought! Yep…that REALLY is all there is to it! It doesn’t get any easier than that! 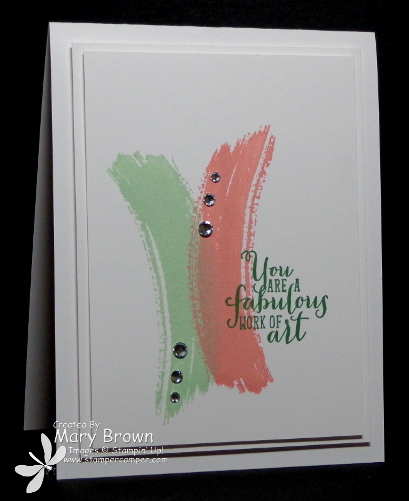 This entry was posted in Challenge, Clean and Simple (CAS) and tagged Work of Art. Bookmark the permalink.